An aloe infused drink is highly effective in improving digestion, strengthening the immune system, and supporting detoxification. Scoop the pulp out of a large fresh aloe leaf and add it to two cups of purified water. Also, add the juice of a large lemon. Blend everything well in a blender and enjoy! The best thing about watermelon is that it can nourish our body with essential vitamins and minerals while flushing the toxins out of it. Hence, cut a handful of chunks or slices of watermelon and keep these submerged in a bottle of water for 2-3 hours. The simple detox drink is ready. Both lemon and ginger are wonderful natural detox agents. Hence, prepare this infusion by adding the juice of half a lemon and one-inch freshly grated ginger to a bottle of water. 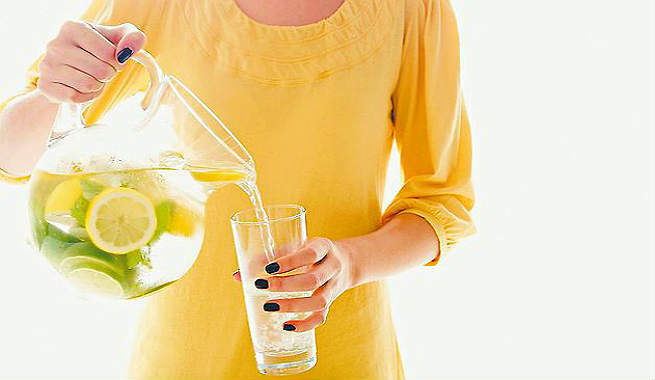 Drink it every morning in an empty stomach and you will get rid of unwanted body fat within a few months. This apple-cinnamon concoction is a perfect slimming water with absolutely zero calories. All you need to do is to add a thinly sliced red apple and a couple of cinnamon sticks to a bottle of distilled water. Keep it in the refrigerator for a couple of hours and you will be good to go. Those who have an inclination towards tropical flavor would love this delicious infusion with amazing fat-burning power. 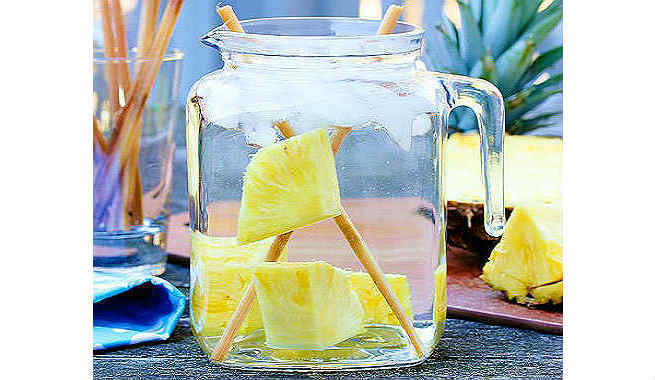 Add a cup of fresh pineapple chunks and two medium-sized sugarcane sticks to a jug full of purified water. Let it stay in the fridge for the whole night. Add a few ice cubes before sipping. Make thin wedges of a small cucumber, slice up a whole lemon, and take a handful of fresh mint leaves. Add all these ingredients to a pitcher full of distilled or spring water and keep it in the refrigerator overnight for seeping. This concoction helps a lot in hydration, digestion, and detoxification. 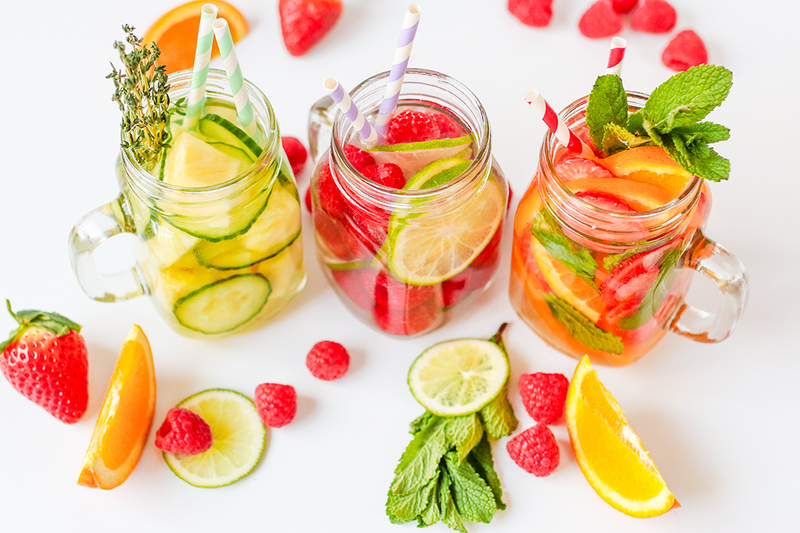 This detox water recipe is a fruity delight. Slice up half of a watermelon, a couple of kiwis, and a handful of strawberries. Add them to a bottle of water and allow the whole thing to sit for 2 to 3 hours inside the refrigerator. 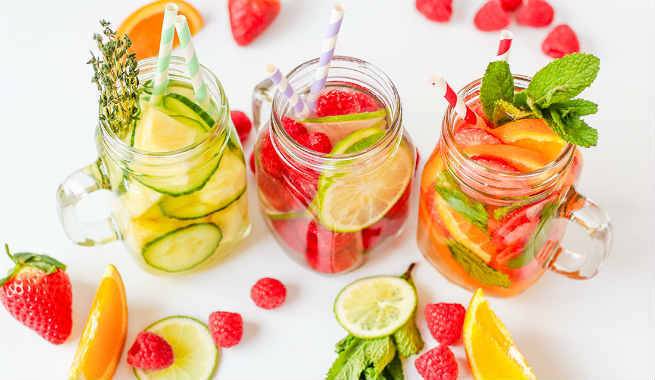 Vitamin A and E present in this delicious detox water will eliminate free radicals from your body and eventually flush the toxins out of your colon. This amazing fruity goodness not only helps in burning excess body fat but also makes weight loss faster. Peel and slice half of a fresh cucumber, chop half of a medium-sized grapefruit, cut lemon and lime into thin rings and add all these to a pitcher full of spring water. Let it sit in the fridge for 3-4 hours and you are ready to slim down! You are already aware of the fat-burning qualities of cucumber, grapefruit, and mint. Adding raspberry and pear to this combo will enhance the metabolism, and eliminate nasty toxins even more effectively. Just slice up all the ingredients and immerse them in a jug full of spring water along with some fresh mint leaves. That’s all! Make an all-in-one detox drink by blending two tablespoons of apple cider vinegar, juice of half of a lemon, and one teaspoon of finely ground cinnamon with a bottle of spring water. Add a thinly sliced apple to it, and you are all set to burn excess body fat through smooth digestion and enhanced metabolism. Cut pineapple into small chunks and slice up the strawberries. Add them to a bottle of water. Add some apple cider vinegar and a handful; of fresh basil leaves to it. Allow the bottle to sit in the refrigerator for a couple of hours. This is a simple fruity detox water with a number of health benefits. And here is the ‘master cleanse detox water’ recipe that will make you a whole lot healthier by removing all free radicals from your body. Take organic maple syrup and fresh lemon juice in equal amounts and add to a large pitcher full of water. Add a dash of cayenne pepper and sprinkle a little sea salt. Combine well and you are done! Adjust the amounts of ingredients as per your requirements. You can always use more fruits for stronger flavors and faster results.